We frequently hear from households and businesses that want an eco-friendly alternative to standard carpet cleaning. This month we answer your questions about vinegar carpet cleaning. Also, check below the article for a customer appreciation special! While a great variety of home and office cleaning solutions exist on the market today, families and business owners often express concern when considering the use of chemicals. We know you want to trust that your selected cleaning products are both safe and effective, whether kitchen, bath, surface or floor. That's why we offer a customized solution for those households and facilities that have chosen a particularly eco-friendly vinegar and water cleaning. I've chosen a vinegar cleaning approach for my home - can PRO accommodate that with natural carpet cleaning? Yes. If you have selected to use only vinegar to clean your living space, count us in! We can customize our carpet cleaning to use only a naturally non-toxic, vinegar and water process. What about other items, such as upholstery or area rugs - can you clean those with a vinegar approach as well? Yes, nearly all fiber types may be safely cleaned with vinegar and water. If it is advisable to clean with any other products, our technicians are trained to identify those and will discuss your options with you. Can a vinegar and water solution successfully treat stains and odors? Absolutely! We recommend vinegar when cleaning odors, and in particular those areas you share with your pets. What if a stain is stubborn and will not lift with a vinegar and water approach? 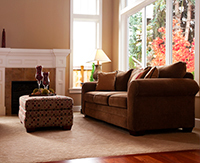 We can spot-treat specifically targeted carpet areas, in order to minimize use of a stronger stain lifting product. If this is needed, you can be assured we will follow up with a thorough rinse. Do you recommend a particular drying process when using vinegar to clean carpeting? If I have more questions about vinegar carpet cleaning? Call any time! If you decide to choose vinegar and water carpet cleaning for your next service, let us know when you call to schedule your appointment. Give us a call at 651-645-0244! *Offer is good when scheduling your service between Monday September 8 2014 and Monday September 15 2014, for cleaning to be completed by October 30 2014. Mention coupon when scheduling. Coupon must be presented at time of service. Service minimum order applies, not valid for water damage service or in combination with other offers.